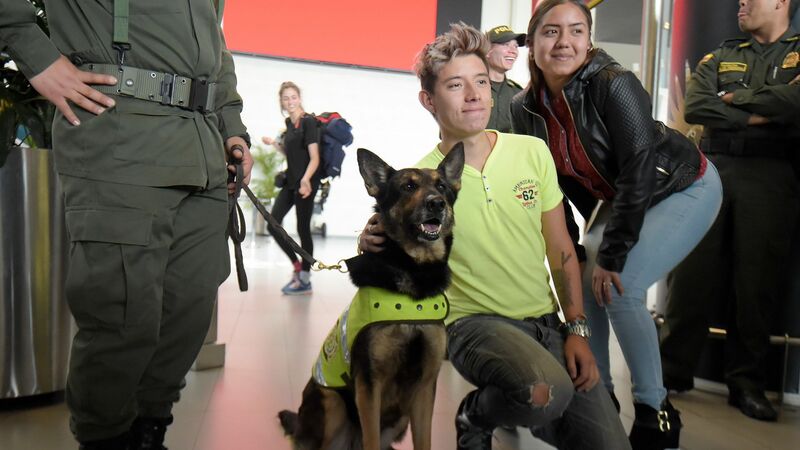 Among Colombia's pantheon of media stars is Sombra, a drug-sniffing German shepherd with a $7,000 bounty on her head — dead or alive — from the irate Gulf Clan cocaine cartel, reports Manuel Rueda of The Associated Press. What's going on: Over her career, Sombra, working with the Colombian police, has pointed the way to more than two tons of cocaine. Sombra is skilled at airports, where she has contributed to a reported 245 drug-related arrests. In one case, she found tons of cocaine hidden among bananas on their way to Europe. In another, she found 170 pounds of the drug hidden within machinery. That record has naturally ignited the ire of the Gulf Clan, so in January, police shifted her duties. Now Sombra sniffs out illicit cargo at El Dorado Airport in Bogota. When she goes off duty, she often has two police guards. Jose Rojas, her handler, tells the AP: "Her sense of smell is far beyond that of other dogs."